Since the late 1970’s and early 1980’s, various private groups (like the Plain English Campaign in the UK) and national governments (like Australia) have been pushing for and implementing “Plain Language” programs. Also referred to as “Plain English” or “Plain Writing,” plain language programs seek to make laws and regulations clear so that can find what they need, understand what they read, and use it to fulfill their needs. “Plain English is clear, straightforward expression, using only as many words as are necessary. It is language that avoids obscurity, inflated vocabulary and convoluted sentence construction. It is not baby talk, nor is it a simplified version of the English language. reduces the number of errors that are made and thus the amount of time and effort that the agency and the public need to devote to correcting those errors. Many companies have switched to plain English because it’s a good business decision. Companies that communicate successfully with their investors form stronger relationships with them. These companies save the costs of explaining legalese and dealing with confused and sometimes angry investors. Plain English versions are easier to read electronically than legalese. Investors will be more likely to understand what they are buying and to make informed judgments. Brokers and investment advisers can make better recommendations to their clients if they understand documents easily. Lawyers reviewing plain English documents catch and correct mistakes more easily. This handbook, and Chairman Levitt’s whole drive to encourage “plain English” in disclosure documents, are good news for me. For more than forty years, I’ve studied the documents that public companies file. Too often, I’ve been unable to decipher just what is being said or, worse yet, had to conclude that nothing was being said.If corporate lawyers and their clients follow the advice in this handbook, my life is going to become much easier. There are several possible explanations as to why I and others sometimes stumble over an accounting note or indenture description. Maybe we simply don’t have the technical knowledge to grasp what the writer wishes to convey. Or perhaps the writer doesn’t understand what he or she is talking about. In some cases, moreover, I suspect that a less-than-scrupulous issuer doesn’t want us to understand a subject it feels legally obligated to touch upon. Perhaps the most common problem, however, is that a well-intentioned and informed writer simply fails to get the message across to an intelligent, interested reader. In that case, stilted jargon and complex constructions are usually the villains. This handbook tells you how to free yourself of those impediments to effective communication. Write as this handbook instructs you and you will be amazed at how much smarter your readers will think you have become. Write with a specific person in mind. When writing Berkshire Hathaway’s annual report, I pretend that I’m talking to my sisters. I have no trouble picturing them: Though highly intelligent, they are not experts in accounting or finance. They will understand plain English, but jargon may puzzle them. My goal is simply to give them the information I would wish them to supply me if our positions were reversed. To succeed, I don’t need to be Shakespeare; I must, though, have a sincere desire to inform. Plain Language streamlines procedures and paperwork, makes it easier to train staff, and increases staff productivity and morale. It reduces confusion, complaints, and claims, and it improves customer satisfaction. It increases sales and raises the company’s standing in the marketplace. The US Department of Veterans Affairs saved $40,000 redrafting one standard letter into plain English. Federal Express, in revising its operations manuals, saved the company $400,000 in the first year. Alberta Agriculture, Food, and Rural Development, in revising its forms, saved $3.5 million. Customers in three surveys of standard letters from banks unanimously preferred the plain English versions. British Telecom cut customer queries by 25 percent by using plain English. The Royal Mail (British postal service) saved £500,000 in nine months by redesigning one form in plain English. A UK Government Plain English initiative saved £9 million in printing costs. Low health literacy is a major challenge confronting American and international health organizations. Research in the past decade has documented the prevalence of limited literacy and limited health literacy skills among adults worldwide. This creates a major policy challenge: how to create text-based health information - a common method of health communication - that is accessible to the public. Plain language is a logical, flexible response. While touted by American, Canadian, and European health policy makers, adoption and promotion of plain language standards and skills in health-focused organizations have lagged. Most text-based health information continues to be too hard for most adults to read. Barriers to more rapid diffusion of plain language are reflected in a set of myths perpetuated by critics. These myths are identified and refuted. While plain language is only one of many broad-based solutions needed to address low health literacy, the benefits to everyone demand increased use by health organizations. Plain Language means clear and effective communication - the opposite of legalese - and it has a long literary tradition. It does not mean baby talk or dumbing down the language. Plain Language and precision are complementary goals, not antagonists. Plain Language is not subverted by the need to use technical terms or terms of art. testing the document whenever possible on typical readers. Plain language does not tend to come naturally to the author of any work and the legislative drafter is no exception. Only the clearest thinkers and writers can absorb the most complicated subject-matters and present information in a way which is accessible to a wide audience. The end product may look easy to write - the reality is that it is much more difficult to simplify than to complicate when writing about a complex topic. Skill and time are both essential if writing is to be made clearer. Plain English writing does not mean deleting complex information to make the document easier to understand. For investors to make informed decisions, disclosure documents must impart complex information. Using plain English assures the orderly and clear presentation of complex information so that investors have the best possible chance of understanding it. Plain English means analyzing and deciding what information investors need to make informed decisions, before words, sentences, or paragraphs are considered. A plain English document uses words economically and at a level the audience can understand. Tone is welcoming and direct. Design is visually appealing. A plain English document is easy to read and looks like it’s meant to be read. A. 16th Congress (2013 to 2016): Senate Bill No. 1092, "Plain Writing For Public Service Act Of 2013" filed on July 24, 2013 by Sen. Grace Poe. Status: pending in the Committee. SEC. 20. Use of Plain Language. - Every government agency shall endeavor to use plain language in their communications orders, compliance, requirements or instructions issued to implement the provisions of this Act. The government agencies shall translate key information into major Filipino languages and present them in popular form and means. (4) Website contents, including, but not limited to financial data, notices and other technical and legal documents, of government agencies must also be written in plain language to ensure that these information are easy to read, understand and use. Status: None of these bills got past the Committee level. A. House Bill No. 5219 "The Wireless Telephone Consumer Protection Act of 2011" filed by Reps. Diosdado Macapagal Arroyo and Gloria Macapagal Arroyo. Section 10 provides that "wireless telephone service providers must provide bills that are clearly organized describe in plain language the products and services for which charges are imposed, and that conform to format standards established by the Commission." Problems: No guidelines on what is "plain language" and no penalty for non-compliance. 1. "Sales and Marketing Guidelines for Derivatives," from SEC document titled "New Rules on the Registration of Long-Term Commercial Papers." The guidelines state that banks must adopt suitability statements that use "simple and plain language" and use "concise and clear messages." Problems: The SEC documents do not provide standards for what constitutes "plain language" or "clear and understandable language." No penalties are provided for non-compliance. C. Bangko Sentral ng Pilipinas Circular No. 702, Series of 2010 (unfair credit card debt collection practices and their sanctions). The circular provides that credit card billings must be printed in plain language. Problems: No guidelines on what constitutes "plain language" and no penalty for non-compliance. D. Supreme Court wallsheets for civil cases and criminal cases. Problem: The wallsheets are intended for the public but they still contain a lot of jargon and legalese. For example, "single sala court." But the wallsheets are a step in the right direction. Enacted in 1979, BP 22 is the most violated criminal offense in the Philippines. The Supreme Court has ruled numerous times on BP 22's provisions. But these rulings have never clarified the term "plain language" in Section 3. "Is this not plain language? Is it not direct language? Is it not strong language? Is it not conclusive language? Yet does the court follow it?" I will be posting in this blog my Plain Language revisions of selected government communications. By showing “before and after” comparisons, I hope that our lawmakers and owners of private businesses will realize the benefits of implementing a Plain Language program. Plain English / Plain Language lecture-seminars I also conduct seminar-workshops for government offices or private companies that want to train their staff in Plain English. Please email me at gtgalacio@yahoo.com or text 0927-798-3138 for details. 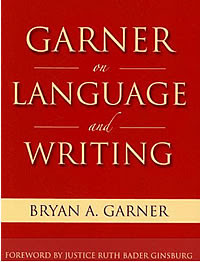 Garner on Language and Writing, by Bryan A. Garner, editor of Black’s Law Dictionary, 749 pages (copyright by American Bar Association) Topics include learning to write, style, persuasion, contractual and legislative drafting, grammar, lexicography, writing in law school, writing in law practice, judicial writing, and all the literature relating to these diverse subjects. Plain Language Medical Dictionary The Plain Language Medical Dictionary widget is a project of the University of Michigan Taubman Health Sciences Library as part of the Michigan Health Literacy Awareness project.